Hey guys! I would complain about the heat but I know you’re tired of hearing about it. Since it’s been too hot to work in the workshop (that’s not complaining, just stating a fact) I haven’t been working on projects. I sure have plenty of inside the house projects I could do but I’m not feeling it. I grabbed the camera yesterday and shot photos of my flowers and their funky containers/stands. This is one of the flower baskets I purchased on the 400 mile yard sale. It’s sitting on my rusty green stool…another junk find from the Nashville Flea Market. The fern is sitting on an old cigarette ashtray stand. On the front porch are some sad little flowers and some happy little flowers. The weathered wood box holds another of the plants from the 400 mile sale. The heat has reeked havoc with my plants. It doesn’t help that I do not have a green thumb….just the opposite. 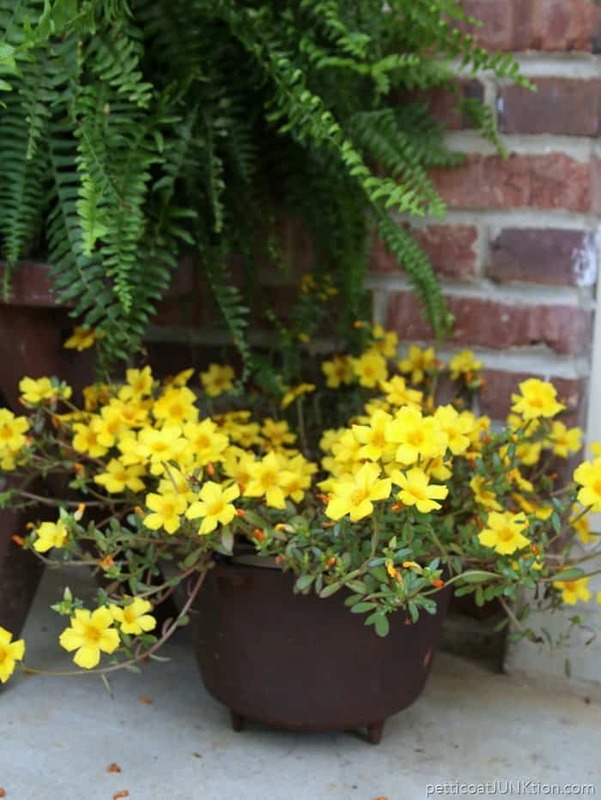 The beautiful yellow flowers are in a rusty iron pot (with handle) that the JTS bought at an auction. 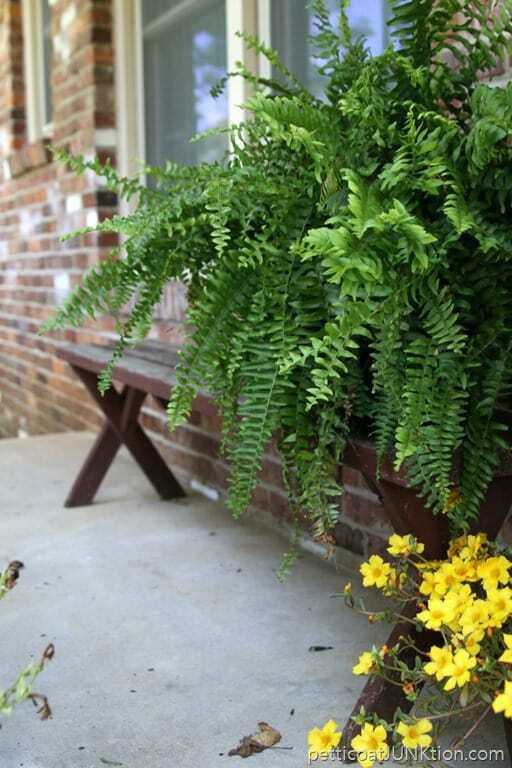 The fern is perched on a weathered wood bench…another $5 junky find from My Favorite Junk Shop. 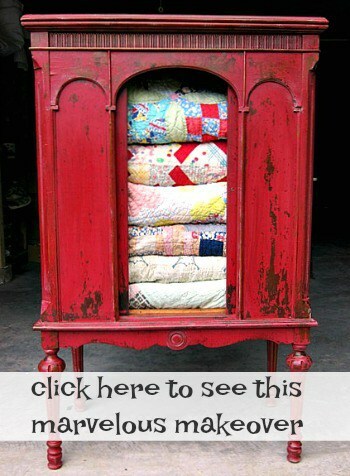 One of my favorite new junk finds is the chippy red and green vintage metal ice chest. I bought it a week or so ago at the indoor flea market in Guthrie, Kentucky. I just set the container of flowers down into the chest. The chest was $8. You guys might also remember the “logger” I found a few months ago. Some of you commented that it was used to roll newspapers. Well, now it’s being used as a flower planter! 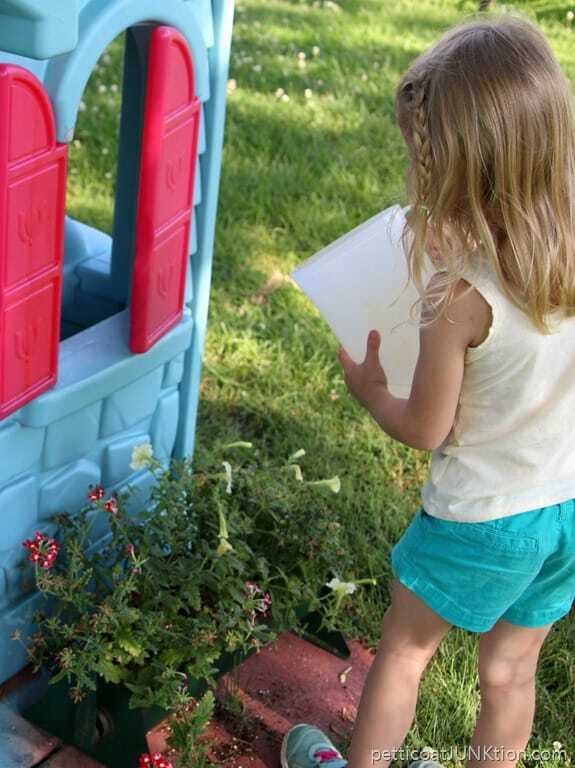 Miss Sofi is watering the flowers in front of her newly painted Little Tikes Playhouse. 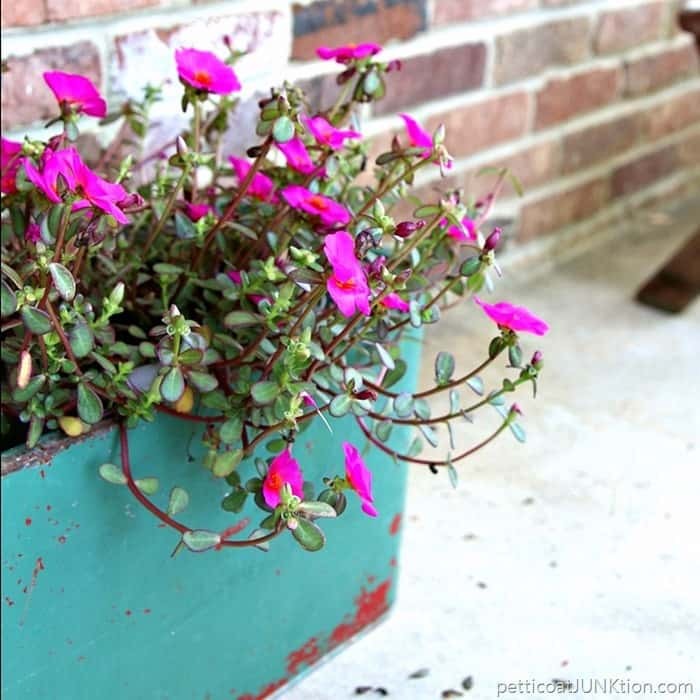 Find more of my rusty plant containers and porch decorations here. What do you think of my planters, stands, containers, etc.? Just about all of them can be used in various ways. I love multi-purpose items. What unique planters or stands do you have? Have a great day and stay cool. See you tomorrow! Love this Kathy!! 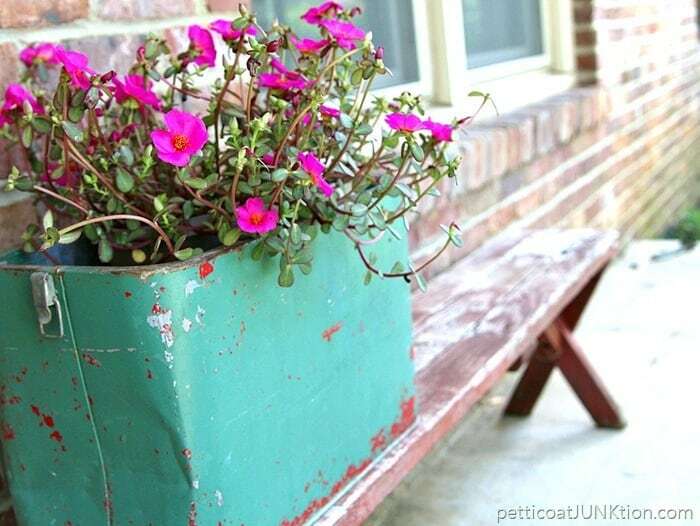 Flowers and plants that are in funky containers definitely make things more interesting. Thank you Maria! You are so sweet. All great ideas and beautiful photos. Thanks for sharing! 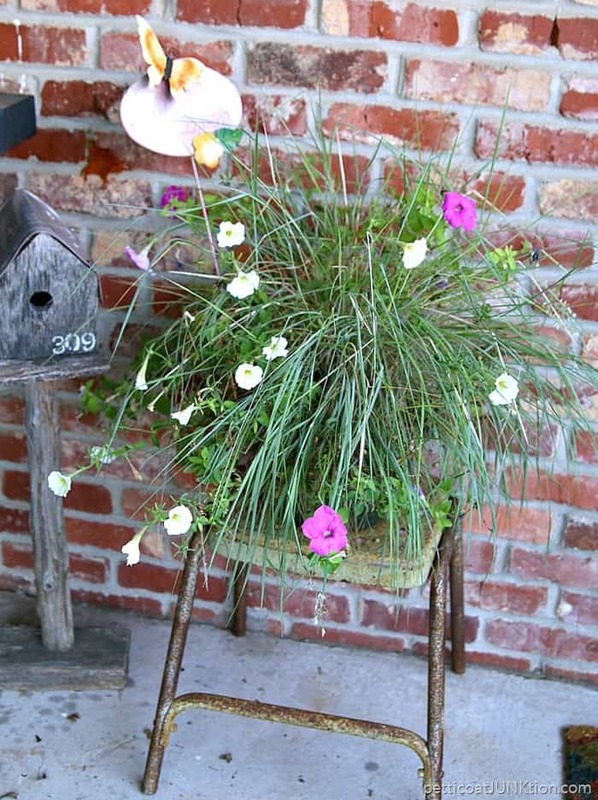 I use an old rusty wheelbarrow for flowers. I love when they all come spilling over the sides! These are such great ideas. Thanks for sharing with us all. Love your color choice. Great ideas! 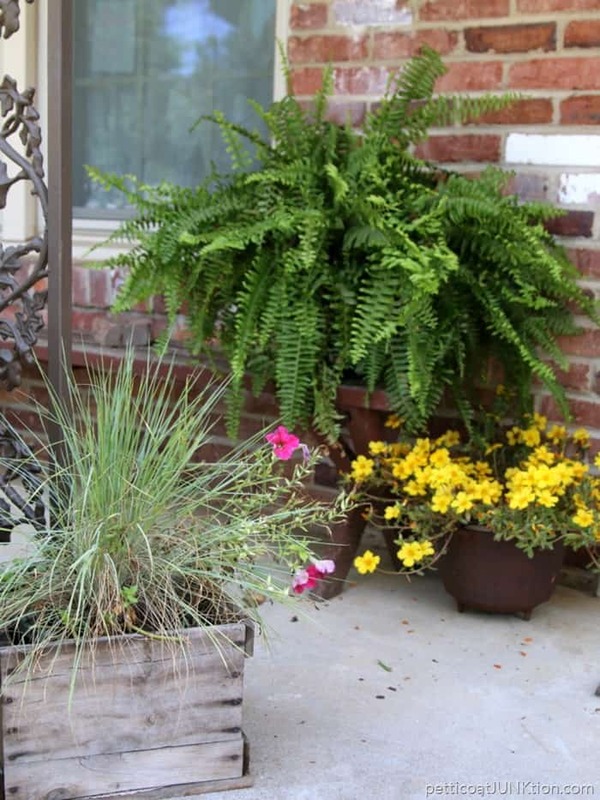 I love those old cauldrons–I had a few that were left by previous owners at my first house that I used for potted plants as well. Thank you for sharing at Merry Monday! I love the icebox! I will be on a hunt for one of those now, always looking for inexpensive planters. Thanks for sharing! Great ideas! Your plants look fine! This heat even up here in North Eastern PA, is taking plenty of extra work this year!!! Love all of them especially the ice chest, I have a old rosting that’s all yucky on the bottom, will do for next yr.
not pretty at all. Ferns are brown, afraid they are going to die from the heat and sun and I cannot put all of them in the shade. 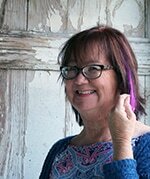 Just joined your blog, I love it, look forward to reading it each day! Your ideas and energy want me to rethink a lot of stuff laying around in my basement. I’m inspired, enjoying the tips!!! The cooler is soo cute! Oh my gosh you made my day! Thank you for reading my blog. Love your great ideas. But have one burning question. 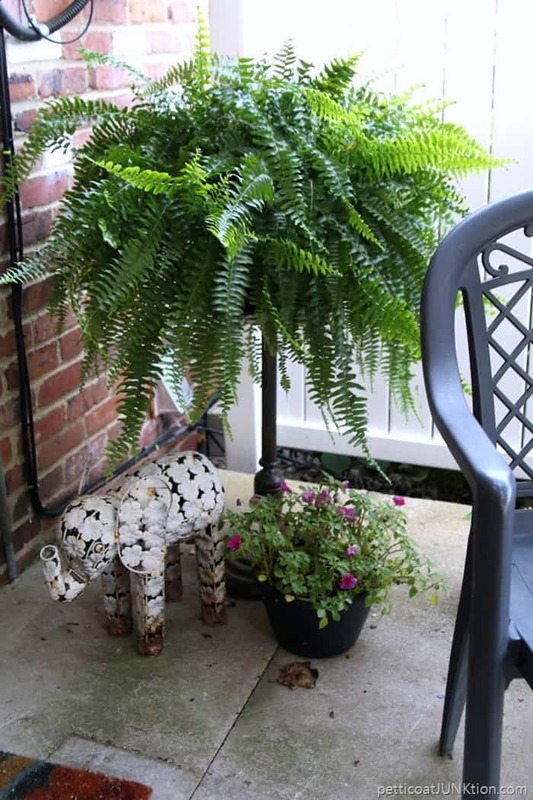 Where can I find an elephant like the one in photo of old ashtray stand with plant in it?? White metal I think. It is adorable!!! Thank you Susan! I found the elephant at a flea market/antique shop and the vendor bought it at a yard sale….. I love your planters! I have planted some sedum in an iron skillet, and some in an old metal lunchbox but both pieces are getting so rusty they’re staining my deck. Do you coat the bottoms of your rusty containers with wax or anything to keep them from ruining your cement and wood floors? I can’t keep scrubbing the wood on the deck – I’ll ruin the stain! Thanks for any advice you can give me. Absolutely wonderful! This for the great ideas!! !